This is the largest memorial site basing on the number of victims buried at the site. It is a resting place for more than 250,000 bodies of victims of the genocide against the Tutsi. The bodies were brought at the place from various places around Kigali City. These include victims who were killed and indecently buried in their homes or found under debris of demolished or burnt houses, those thrown in ditches and trenches, in rivers and other water bodies, from bushes and shrubs, etc. 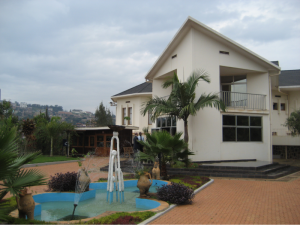 The Memorial Center is divided into three major exhibition sections including one that documents the 1994 Genocide against the Tutsi. There is also a children’s memorial and an exhibition on the history of genocidal violence around the world. There’s also another section hosting the Education Centre, Gardens, and Genocide Archive of Rwanda which form part of a meaningful tribute to those who perished, and provide a powerful educational tool for visitors. The memorial was inaugurated in April 2004.